Below picture shows kiln car of base structure at tunnel kiln. Pipes stick out from buttom of kiln car, putting covers on top of the pipe and solid beams mounted on the covers, which is a conventional way of structuring. 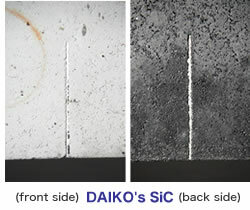 In the pictures below, You can see the difference between our SiC and other company's SiC. Generally, the light colored, other company's SiC refractories, are easier to be fatigued than ours. 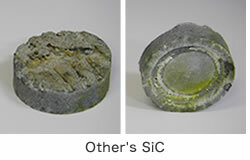 The close up image of the other company's SiC, one which is used more, you can see porous surface and it is quite rotten. If you touch, its surface crumbles easily. 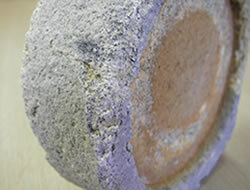 This is because the materials used are different even though both are called SiC refractory. If the SiC refractory gets whiter in color and expands gradually after usage, it considered lower quality. We can provide high quality SiC pipe, cover and solid beam. If you think your SiC kiln furniture looks fatigued quickly, please check ours and compare the endurance. 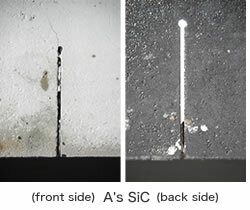 One of the reasons why people do not want SiC Plate with slits is because of dropping filling dust from slits part. However the endurance of slit filling is also different for each company. 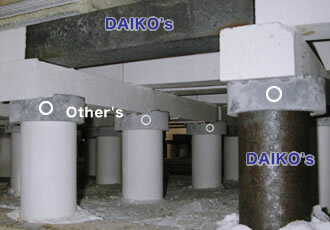 The left one is company A's SiC plate and right one is Daiko's. Our product's slit filling is hard to come off compared to the competitor's. The reason for the difference is shown in picture below, notice the cross sectional picture of slit part. Upper A's filling is hollow in middle, but ours is not hollow and slit is densely filled, (white material is slit filling). If the middle is hollow, the filling will easily come off and fall on products at lower layer. The material composition of filling also determines it's endurance. The easily oxidized SiC Plate tends to expand itself, consequently slit parts gradually become widen, then the filling easily comes off. 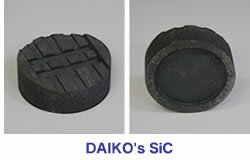 Daiko's SiC Plates excel in this point and no filling drops out from slit part. We use above Oxide Bonded SiC for SiC Plate and other shape SiC refractories. We can provide higher performance, advanced SiC kiln furnitures for special use.Please refer to "Advanced SiC Refractory Page" for more details.